As a bonifide engineering geek, I’m always itching to measure something and over the years I have acquired some decent tools to do so. I understand that much of this is overkill for most woodworking and I fully subscribe to the “don’t measure with a micrometer what you cut with a chainsaw” philosophy. But when it comes to machine setup, I make the extra effort, since these establish your benchmarks for every cut you make. That said, I thought I’d put up some pics of how I do things and invite you all to do likewise. Here’s the maiden voyage for a fixture I recently made that rides in the miter slot on a table saw for a plunger style dial indicator. It’s a clone of the A-Line-It jig. And here it is in action today…. I used a combination square when I set up and aligned the TS. 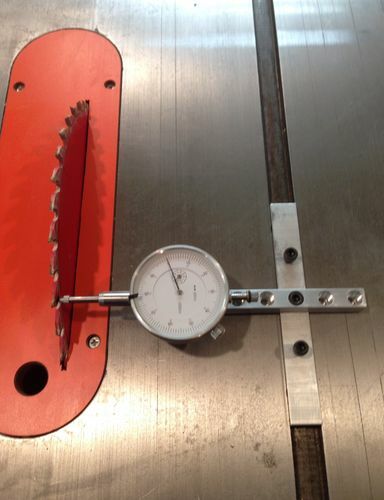 Checking it today, the Blade varies ~ 0.001” front to back (rotating the blade to measure off of the same tooth to take variation in the blade out of the equation). So that validates that you can do a darn good setup with a combination square and some patience. I’m not touching this set up. This is a mid 80’s Jet TS that came with the Biesemeyer fence from the factory. The fence is very rugged and has held it’s alignment well. I was drifting ~ 0.005” so I gave it just a little tweak. Most of this is probably due to the spray glue I used to apply the laminate to the fence when I refurbished it. When it come to setting up woodworking machine I do not believe in “overkill”. Get you machines as perfect as you can. There will be plenty other things to throw you off as you progress through your project. Can I borrow that please! I like precision also. I try to align my tools as perfectly as I can. 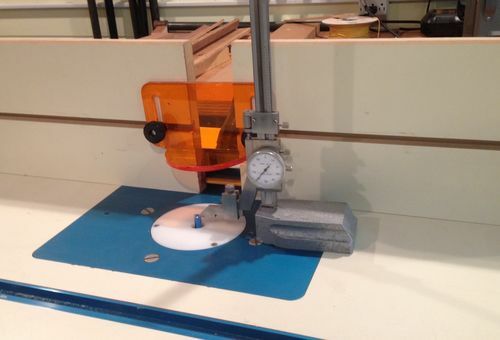 Using a homemade aligning gauge with a dial indicator for alignment of table saw blade to miter slot. Although I am also at .001 from front to back when the blade is at full height, I am .004 off when the blade is lowered to about 1.5 inches. 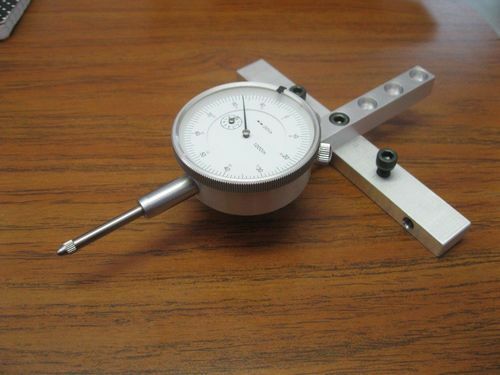 I also like to use the dial inicator on a magnetic stand to measure runout on my table saw arbor and lathe spindle. Precision tools are fun. On the other hand, my woodworking is not so precise. Nevertheless, as indicated above, I also always strive to get the tool as well aligned as possible. We have a little prototype machine shop at work in a converted garage and I get to work with a semi- retired, real deal, old school machinist. I dabble in metal working as a side hobby and I’m learning a lot from him. I get tool borrowing privileges now and again and this weekend I have this cool little gizmo that is used for tramming a milling machine head. 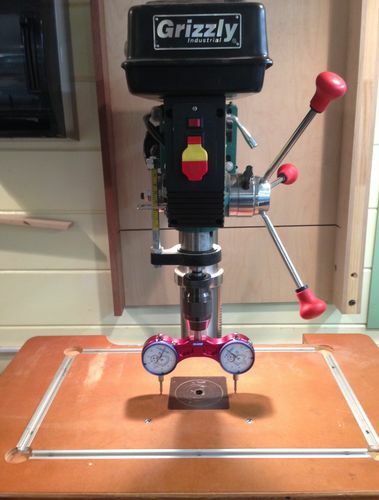 So this weekend I’m using it to tram my drill press to the table. It’s a little cumbersome as I have to put shims between the wooden table and the drill presses steal table to get the front to back adjustment. They are quite easy to make from metal or wood. I made one from mahogany a few years ago. Maniac, you did a good job on the jig, but it’s still overkill. It does not need to be square coming off the guide slot. No matter the position, as long as it’s in the slot, and you can get the plunger on the indicator to make contact, the dimension will not change unless your blade is warped. It’s like drill press and router fences, they don’t need to be square to the bits. I see your point Jerry… I just copied it from pics on the net. Two short pieces of Aluminum bar and some holes. 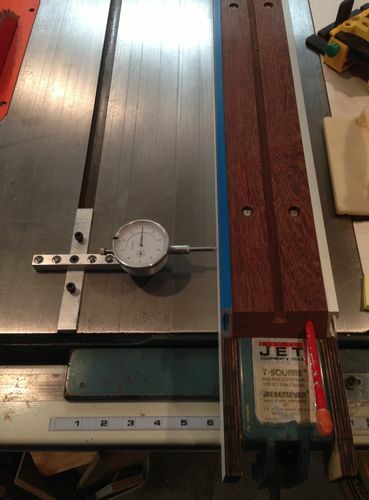 With a smile on my face, how does this differ from the people measuring there plane shavings in thousandth of an inch? If it winds your crank, go for it. I know, that was my way of giving a compliment. Hey guys… this is just how I geek out in the shop. As mentioned in the OP, I do hobby metal working in the same shop as my woodworking, so having access to these tools, I’d be daffed if I didn’t take advantage of them. 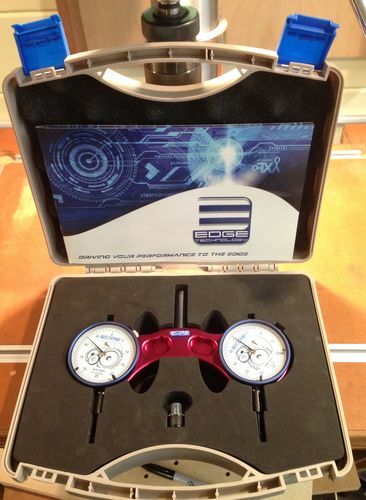 I am in no way trying to imply that woodworkers should run out and buy these types of metal working measuring tools. 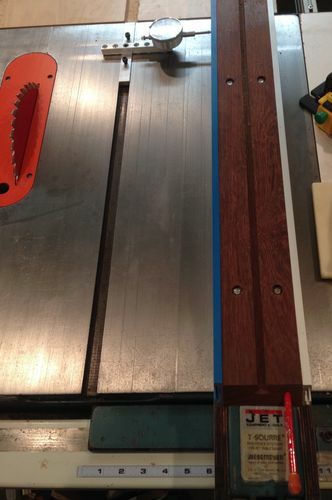 Having said that, here’s a spiffy way to set TS blade height or router bit height…. Many will say “overkill”, but having a “precision” mentality, I find it easy to do woodworking using precision measuring tools, mainly because I already have them for use with my metal working. I can set up and cut a piece of wood that is within a couple of thousands and I know it will change over time, but if it does change, it will still be within working dimensions. I have made things (train models) from hard woods and surprisingly, their dimensions have not changed much if not at all. I guess as long as the projects are made and remain in a controlled weather environment, dimensional changes should not be a problem. I find that working to precision is fun and gives me much satisfaction. It is a skill not everyone has and it is easy and rewarding to learn. It’s the difference between a rifleman and a sniper. I make no claim to have special skills, just having fun.